Angelina Jolie is clearly a talented actress and humble humanitarian, not to mention she possesses the beauty of a mythical goddess. 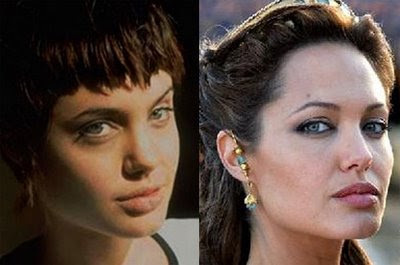 But has Angelina Jolie dabbled in plastic surgery to achieve her current appearance? Well the answer would appear to be yes, as documented in the following before and after pictures. It seems she has most certainly had a nose job procedure, also known as a rhinoplasty. Upon first glance it appears quite evident that Ms. Jolie has indeed opted for plastic surgery. Her pre-surgery nose was much more pudgy having a rounded tip, adorable to say the least. The post-surgery nose job resulted in a more refined bridge and much pointier tip, which is apparently preferred in show business for leading ladies. See the before and after photo comparisons listed below and let us know what you think. Nose job or no job? I haven't had anything done and I don't think I will. But if it makes somebody happy then that's up to them. I'm not in somebody else's skin to know what makes them feel better about themselves. But I don't plan to do it myself. And while we would absolutely love to take Angelina at her word, the numerous before after pictures tell a very different story. Its also worth mentioning, as many of you already know, the human nose continues to grow and take shape throughout the entire course of our lifetime. However, the growth is very slow and subtle. 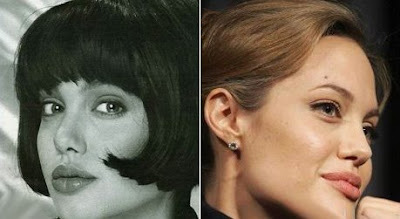 In the case of Angelina Jolie, the distinct alteration of her nose appeared quite apparent in just a few short years, which is why there has been so much controversy and speculation regarding her presumed nose job plastic surgery. Aside from the nose job hysteria, Angelina Jolie has also been front and center of a few additional cosmetic surgery rumors. Breast implants have been a topic of debate for many years now, however, our analysis indicates she is all natural in that department. And perhaps her most talked about feature, being her lips, has also received a wealth of speculation. We've heard about possible lip implants, or perhaps collagen lip injections. But the same photographs that verify her nose job, vindicate her purely God-given lips. 100 percent real! 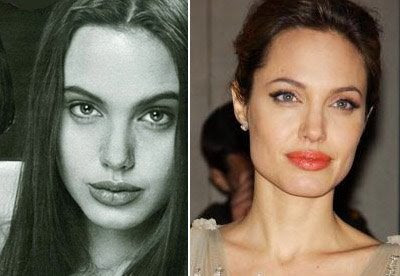 Apart from the nose job operation, we strongly believe that Angelina Jolie is plastic surgery-free. In our eyes, all the other myths have officially been busted! With the exception of possible facial injections which are sometimes difficult to detect, so we'll leave a question mark on that subject. So I guess you can add plastic surgery to her resume. A spectacular resume that includes 25 award wins plus an Oscar for her highly praised role in the movie 'Girl, Interrupted'. Not only has she experienced tremendous success on the silk screen, Angelina is also an outstanding mother of six children. While she isn't looking after her army of little ones, or prepping for her next movie role, Angelina is a dedicated humanitarian worker, donating time and money to several impoverished nations. but i don't think she had a nose job at all! she's way to perfect, angie doesn't need it. i dunno...i think she may have done something to brighten her eyes too. it'd not just her nose that looks modified...to me it seems like her face looks different ! is it just me ? She just was born beautiful. anyone just undergo natural changes in his/her own face, definitely through time and sometimes, through good make up. I think not only angelina jolie or any other celebrities undergo that natural change... i think everyone, even me, I was ugly when I was younger, but now, many says I'm pretty. This second picture proves that she has her nose don. She is a liar! As was said that second set of photos, the one on the left, is NOT Angelina and that is the one in my opinion that is the most dramatically different. Over time and years all people have changes to their face and even if she did have surgery it is her decision and no one elses business. Her life. Her business. well, she has had jaw and cheek implants, lip reduction, nose job and a facelift and a browlift. she is still so beautiful. As crazy as it sounds it looks like she's had her lips plumped. Her lips are fuller now than when she was younger, that doesn't happen naturally. Usually your lips are less plump by your late 30's 40's. Definately had a nose job as well. Your nose doesn't become more defined on it's own. I used to think that it was just youth that caused celebrities to appear so different on those old high school photos, now I'm aware. Most have had nose jobs and more. 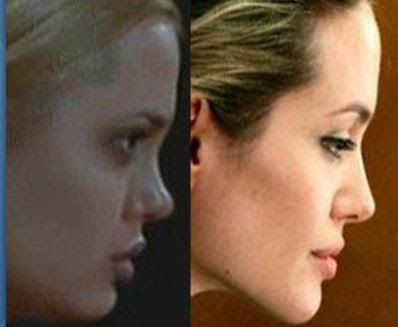 While I have serious doubts as to whether that second before/after is even Angelina Jolie to begin with, it's painfully obvious that she's had her nose done -- that last set of pictures is the clincher. Her lips have apparently always been really full (unless she discovered collagen injections long before everyone else), but I think you can definitely put her down for Botox (forehead, not around the mouth) and quite possibly cheek implants (although the latter could be a function of losing baby fat). In the end, so what? I generally assume everyone in Hollywood (or every wannabe, like the Kardashians) has had some sort of work done. If it's subtle and well done, like Angelina's and Salma Hayek's noses, fair play to you. If it's a trainwreck (I'm looking at you, Melanie Griffith), what nature gave you was perfectly fine, and that's what you get when you bulldoze it and try to redesign it your way. The second one is her. It was when she was in Gone in 60 seconds. She had blonde hair. Actually people make the mistake to believe those before pictures correspond to her natural nose, but actually its already the nose after rhinoplasty, in a over rotated nose tip period. The trend is that the tip drops in few months while swelling starts to be healed, reaching the shape her nose got nowadays. I hate celebs when they lie. They are in the public eye, so it is going to be speculated. Fess up or dont be trusted! Sorry but I don't think this woman is attractive at all. So many much prettier out there, but everybody goes crazy over ang. I'll never know why. It's hard to know what is natural about her anymore. I think the plastic look is very unattractive. Look at Shane Warne he looks like a Ken doll.